alaTest ha recogido y analizado 16 comentarios relacionados al producto Lifx B22 LED Smart Light Bulb. En promedio, la calificación para este producto es 4.4/5, al ser comparado con la calificación 4.5/5 de otros productos en la categoria productos. Analizamos las valoraciones de los usuarios y los expertos, la edad del producto y demás factores. Comparado con otros productos el Lifx B22 LED Smart Light Bulb recibe una alaScore™ global de 89/100 = calidad muy buena. My LIFX lights work like a dream. This bulb works fab. Standard bayonet connector. Easy to set up WiFi and iPhone app. Works great with Alexa.little expensive but will buy more as price comes down. No bridge needed. Bulb works great. App hasnt recognised the bulb once and another time I couldnt turn the effect off, but other than that, its great to be able to control the lights brightness without having to trial loads of different bulbs. 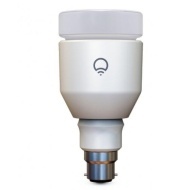 Wifi bulb - good...but is it really needed?! smarter than the average light bulb.